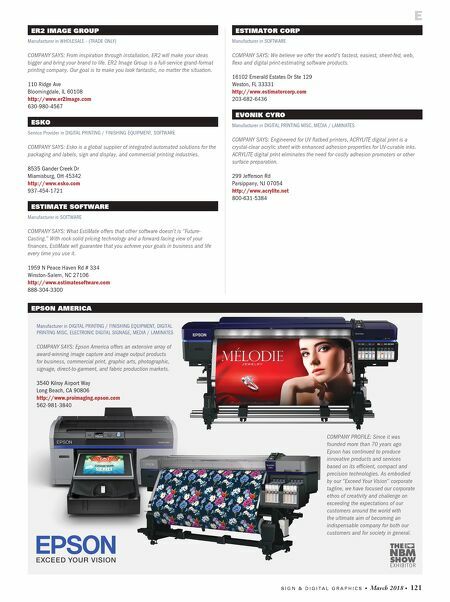 120 • March 2018 • S I G N & D I G I T A L G R A P H I C S ENCORE PRODUCTS/DIV OF NEWELL OFFICE BRANDS Manufacturer in DIGITAL PRINTING MISC, MEDIA / LAMINATES, SIGNAGE DISPLAY / EXHIBIT SYSTEMS COMPANY SAYS: EnCore Products, a division of Elmer's Products, Inc., is a manufacturer of foam board substrates in a variety of surface, thickness and sheet size combinations. EnCore has introduced a Design Board category to enhance creative signage. 2020 W Front St Statesville, NC 28677 http://encoreproducts.com 800-873-4868 ∙ 203-283-3361 ENVIRONMENTAL GRAPHICS INC Manufacturer in ARCHITECTURAL & STOCK SIGNS, SIGN COMPONENTS / HARDWARE, WHOLESALE - (TRADE ONLY) COMPANY SAYS: Environmental Graphics, Inc., is proud to be an industry leader in architectural and ADA signage. Founded in 1992, EGI has established itself as a premier manufacturer of both interior and exterior signage systems. 11232 Challenger Ave Odessa, FL 33556 http://www.egisigns.com 727-376-5596 SEE EPILOG LASER'S LISTING BELOW SEE EPSON AMERICA'S LISTING ON PAGE 121 EGL CO INC Manufacturer in CHANNEL LETTER SYSTEMS, ELECTRONIC SIGNAGE (LED / NEON) COMPANY SAYS: EGL has evolved from strictly a neon company, to a full-service lighting organization. As "Your Illumination Solution," EGL has expanded its product line to include high-performance LEDs including the Boxstar II and V-640 lines. 100 Industrial Rd Berkeley Heights, NJ 07922 http://www.egl-lighting.com 800-345-9010 ∙ 908-508-1111 ELECTRIC TIME CO INC Manufacturer in SIGNAGE DISPLAY / EXHIBIT SYSTEMS COMPANY SAYS: We are a tower clock and street clock manufacturer. 97 West St Medfield, MA 02052 http://www.electrictime.com 508-359-4396 ELECTROMENU Manufacturer in ELECTRONIC DIGITAL SIGNAGE, SOFTWARE COMPANY SAYS: ElectroMenu replaces static menu boards with HD-LED displays. Non-Windows platform with design tools embedded in the product to easily create and maintain animated menus, specials and promotions in seconds. No PC or internet connection required. 200 Turner Industrial Way Aston, PA 19014 http://www.electromenu.com 855-226-4430 E COMPANIES EPILOG LASER Manufacturer in FABRICATION & INSTALLATION EQUIPMENT, LASER ENGRAVERS, SIGN & WRAP SHOP TOOLS / SUPPLIES, SOFTWARE COMPANY SAYS: Epilog Laser is a leading manufacturer of CO 2 and fiber laser engraving, cutting, and marking systems. Used throughout the signage industry, Epilog systems can cut/engrave a variety of popular materials including acrylic, wood, plastic, and more. 16371 Table Mountain Pkwy Golden, CO 80403 http://www.epiloglaser.com 888-437-4564 ∙ 303-277-1188 COMPANY PROFILE: Whether you're looking for CO 2 cutting systems or fiber engraving/ marking systems, Epilog Laser has the right machine for your needs. 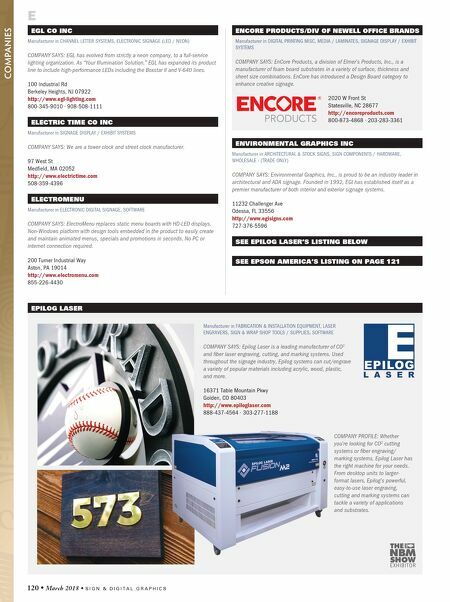 From desktop units to larger- format lasers, Epilog's powerful, easy-to-use laser engraving, cutting and marking systems can tackle a variety of applications and substrates.